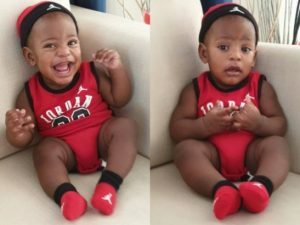 Celebrity blogger, Linda Ikeji, on Thursday took to her Instagram page to gush over her four and half months baby, Jayce Jeremy. Sharing the pictures, Linda Ikeji warned people to hide their daughters whom she say will be rushing her son, adding that she can’t get over how fast he’s growing and how handsome he is. “Jayce is just 4 and a half months old and he’s already buff…hahaha! Check out his muscles ?????. In about 18 years from now, you mums will have to hide your daughters. “Dem go dey rush my pikin. ???. Can’t get over how fast he’s growing and how handsome he is. And he’s such a happy boy!??? ?,” she wrote after the post.